The greatest threat to the digitization of society comes from a threat that government will use surveillance of personal transactions as a means for instituting totalitarian controls over personal behavior. A pervasive systems for tracking what people do will then become the basis for exercising a total grip over personal, financial, commercial and political expressions. Computerization then becomes one of the tools for suppressing individual freedoms an liberties of individuals. The earliest example of computer-enabled control is the application of tabulating machines for the purpose of managing the Holocaust in Nazi Germany. This event can serve as a case study about the cooperation of computing with a totalitarian regime. In the early 1880s, Herman Hollerith, a young employee at the U.S. Census Bureau, conceived of the idea of creating readable cards with standardized perforations, each representing specific individual traits such as gender, nationality, religion and occupation. The millions of punched cards created for the national census could be then be sorted on the basis of specific bits of information thereby providing a portrait of the nation and its citizens. In 1910, the German licensee Willy Heidinger established the Deutsche Hollerith Maschinen Gesellschaft (German Hollerith Machine Corporation), known by the acronym "Dehomag." The German licensee Dehomag later became a direct subsidiary of the American corporation CTR that was subsequently renamed as the International Business Machines (IBM). There was an ongoing business relationship between Watson's IBM and the emerging German regime headed by Adolf Hitler and his National Socialist German Workers Party (NSDAP). Hitler came to power in January 1933; on March 20 of that same year he established a concentration camp for political prisoners in the Bavarian town of Dachau, just outside the city of Munich. Repression against political opponents and the country's substantial ethnic Jewish population began at once. By April 1933, some 60,000 had been imprisoned. Business relations between IBM and the Hitler regime continued uninterrupted in the face of broad international calls for an economic boycott. Willy Heidinger, who remained the chief executive of Dehomag, the German subsidiary that IBM owned 90%, was an enthusiastic supporter of the Hitler regime. On April 12, 1933, the German government announced plans to conduct a long-delayed national census. The project was particularly important to the Nazis as a mechanism for the identification of Jews, Gypsies, and other ethnic groups deemed undesirable by the regime. Dehomag offered to assist the German government in its task of ethnic identification. This activity was actively encouraged and financially supported, with Watson himself traveling to Germany in October 1933 and the company ramping up its investment in its German subsidiary from 400,000 to 7,000,000 Reichsmarks. This injection of American capital allowed Dehomag to purchase land in Berlin and to construct IBM's first factory in Germany, tooling up for what it correctly saw as a massive financial relationship with the Hitler regime. It has been alleged that a "secret deal" was made between Heidinger and Watson during the latter's visit to Germany which allowed Dehomag commercial powers outside of Germany, enabling the now Nazified company to circumvent and supplant various national subsidiaries and licensees by soliciting and delivering punch card solution technology directly to IBM customers in those territories. As a result, Nazi Germany soon became the second most important customer of IBM after the lucrative U.S. market. The 1933 census, with design help and tabulation services provided by IBM through its German subsidiary, proved to be pivotal to the Nazis in their efforts to identify, isolate, and ultimately destroy the country's minorities. Machine-tabulated census data greatly expanded the estimated number of Jews in Germany by identifying individuals with only one or a few Jewish ancestors. Previous estimates of 400,000 to 600,000 were replaced for a new estimate of 2 million Jews in the nation of 65 million. As the Nazi war machine occupied successive nations of Europe, capitulation was followed by a census of the population of each subjugated nation, with an eye to the identification and isolation of Jews and Gypsies. These census operations were intimately intertwined with technology and cards supplied by IBM's German and new Polish subsidiaries, which were awarded specific sales territories in Poland by decision of the New York IBM office following Germany's successful Blitzkrieg invasion. 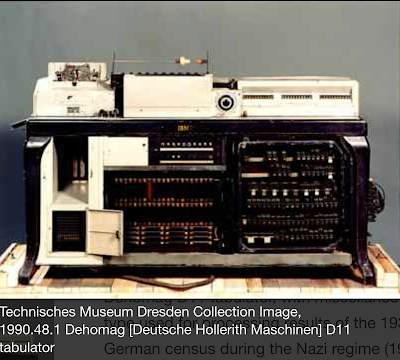 Data generated by means of counting and alphabetization equipment supplied by IBM through its German and other national subsidiaries was instrumental in the efforts of the German government to concentrate and ultimately destroy ethnic populations across Europe. Every Nazi concentration camp maintained its own Hollerith-Abteilung (Hollerith Department), assigned with keeping tabs on inmates through use of IBM's punchcard technology. Without IBM's machinery, continuing upkeep and service, as well as the supply of punch cards, whether located on-site or off-site, Hitler's camps could have never managed the numbers they did. The relationship between IBM and Nazis can be seen as an early enablement of digitization and totalitarian efforts to increase the efficiency of a state bureaucracy. We view a comprehensive administrative system as the essential pre-requisite for the institution of an efficient police state. George Orwell in his utopian book "1984" outlined a state where surveillance was delivered through ubiquitous listening devices. We reject the Orwellian views because the population of audio auditors to the monitored population cannot be implemented economically. Computer networks, supported by Artificial Intelligence, will soon offer the delivery of an efficient police state as a practical offering. Time has come to place the bureaucratization of computer-surveillance on the top of the list of threats to the core of our values of liberty and freedom. Biographical note: Paul Strassmann, with help from the Imperial College in London, noted the application of computers to government control of a population in his 1985 book on the transformation of work in the electronic age. In 1989 Strassmann found that there was a still working tabulating operation in former East Germany. The installation was purchased by the US Holocaust Museum in Washington, after authentication by Strassmann. It still remains on display as one of the earliest precursors of what is now an increasing threat of computerized bureaucratization.